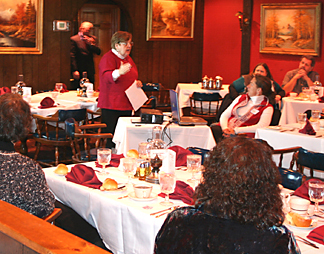 Suffolk residents enjoyed a complimentary lunch and an educational forum about hearing loss when they attended “Lunch and Learn” seminars in Greenport, Southampton, Riverhead and Patchogue over the past several months. The events were held locally at Jerry and the Mermaids in Riverhead, Soundview Restaurant in Greenport, South Shore Restaurant in Patchogue and the Four Seasons in Southampton throughout the past few months. “More than 26 million Americans have hearing loss,” noted David Carr, owner of McGuire’s.”Many people learn to cope with this disability, and go for years before they acknowledge a problem hearing environmental noise and understanding speech. We try to teach people about hearing loss and hearing devices so they can make an educated decision about their hearing health,” she added. The “Lunch and Learn” series is on-going. Interested residents should call McGuire’s at (631) 369-2808 for information on any planned seminars.